This is the best photo I took this past week. 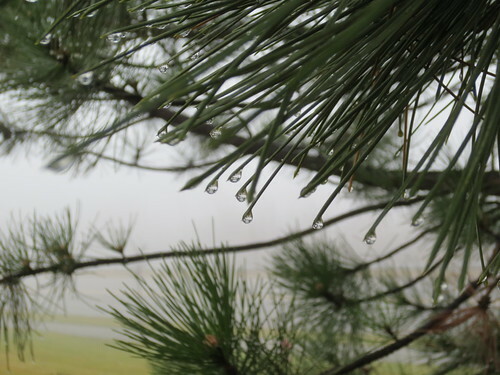 Walking back to my car after dropping off a package at the post office, I took a very slight detour into their loading dock area and snapped this shot of the dripping pine needles against the foggy background. I’m sure someone with a better eye for composition and more knowledge about photography could have done more with the scene, but I’m happy with how this came out, the best of the four or five photos I took as I stood on the curb at the end of the spot where the big trucks park when they come to load up the mail to take it to the sorting center. Usually I’m there when a big truck is, at the end of the day, but this particular day I managed to escape the office and run my errands at lunchtime. I could have passed right by this spot, as I have every other time I’ve been to that post office; I’m glad I didn’t this time.